There will be intermittent lane closures and/or street closures in the work zones and motorists are encouraged to use caution when driving through these areas. Richmond Police will be in charge of traffic control therefore motorist and pedestrians must be mindful to be alert at all times throughout the construction zones. The above scheduled dates may change due to inclement weather. The above scheduled dates may change during inclement weather. To learn more about City services and programs, please visit, www.RichmondGov.com. The City of Richmond is hosting the “Framing the Issues and Looking to the Future” Health Care Symposium on November 8-9, 2012, in the city’s downtown. The symposium will focus on the health care delivery system in the city of Richmond, with a goal of engaging the broader community in dialogue about ways to attract and retain health care practitioners to live and work in the city. "There is a long-standing shortage of minority physicians in the United States and we need more primary care professionals practicing in the most underserved communities," said former U.S. Health and Human Services Secretary and The Sullivan Alliance founder Louis W. Sullivan, MD. "I commend Mayor Jones and his team for their creative approach to solving this urban health challenge. Their successful outcome could become a blueprint for urban communities nationwide." 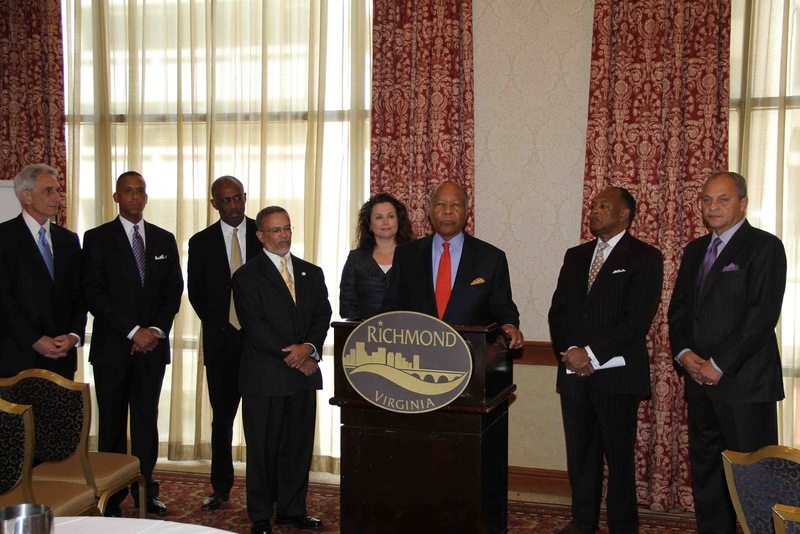 Scheduled for Thursday, November 8, and Friday, November 9, the Symposium will bring together leaders from the city of Richmond, including government officials, health care practitioners, providers and executives, insurers, academicians, students, and other key stakeholders. Joining the City with support in hosting the event is Cigna. On the evening of November 8, a reception will feature remarks from Mayor Dwight C. Jones. Joining Mayor Jones will be Dr. Michael Rao, President, Virginia Commonwealth University, and Dr. Louis Sullivan, Chairman and CEO, The Sullivan Alliance to Transform the Health Professions. The Mayor is also welcoming the presidents of Morehouse School of Medicine, Meharry Medical College, Charles Drew University of Medicine, Northeast Ohio Medical University and Science and Howard University College of Medicine. Friday’s general session will be a solution-focused process focusing on capacity building for health care practitioners. The sessions will be facilitated by a host of distinguished speakers and moderators. This Symposium is part of Mayor Jones’ continued effort to improve the health and well being of city residents. Last year, the City hosted a Communities of Health Forum and the Mayor has also launched several city initiatives, commissions, and task forces focused on health and well-being, including the Pedestrian, Bicycling and Trails Commission; Breast Feeding Commission; Food Policy Task Force; and the recent Healthy Richmond Campaign. For more information about the Health Care Symposium, please contact Keisha Smith at Keisha.Smith@Richmondgov.com.